Home away from home. Fully Furnished Private Property, clean and comfortable! Enjoy the entire property and house to yourself. Clean and comfortable stay within 10 km to Brisbane CBD, close to the Westfield Carindale Shopping Center, public transport. Very good location! 3 bedroom house with large private backyard gated to beautiful secluded park Perfect for all ages. Relaxed country house feel. Good central location! 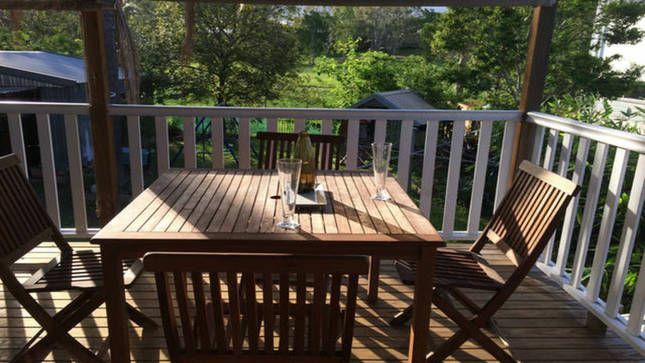 Within 9 Km to Brisbane CBD, short walk to cafes, shops, buses. Within 2 Km to the Westfield Carindale. Gold Coast 40 min drive, 60 min to Sunshine Coast. airport 15 mins drive when there is no traffic. Close to sport venues inc. Clem Jones, Chandler, Gabba, Qld Hockey. Pembroke On The Park is well located, central to everything, in the popular inner city suburb of Carina. We offer a discounted rate as the house is an older style character home and some updates are required. The house is clean and well presented inside and has a lovely large private back yard with a great outlook. It has a kids timber cubby house (The Mulberry Club) with a few fruit trees growing nearby. As the house is old and some items need to be updated, we have taken this into account when setting up the nightly rate. There is easy access to the park that contains, free tennis courts, kids playground and bike track, basket ball and netball court and cricket nets and a huge gumtree lined open field and a City Council library, all within a short walking distance from the back yard. The Clem Jones local pool and sports centre just around the corner. It is within 9 km drive to the Brisbane CBD, the world famous Wolloongabba Stadium and beautiful Southbank with it's parkland's and museums. One of Brisbane's largest shopping centres, popular Westfield Carindale is walking distance away (1km). It has the Glass House with great restaurants open every night. Carina League's Club is also around the corner with nightly entertainment, meals etc. Transport to the city is easy with buses leaving from both Old Cleveland Road and Stanley Road every few minutes..
My wife and I enjoy travelling. As we are caught up in the day to day of life it is a small pleasure of ours to see others travelling and enjoying a well earned break staying at the house at an affordable rate. We had lived in the house for many years and enjoyed the park and it's facilities. We knew that it would be a great place to stay for travellers as there is so much to offer and it is very affordable for the savvy traveller. The house is an older style house, but is clean and loved. And we know you will love it too. Backs into a park. Very affordable and clean in a great location within 9 km to Brisbane City, a short drive to the famous Woolloongabba Stadium and within 2 kilometres to the Carindale Shopping Centre. Approximately half way between the Gold Coast and the Sunshine Coast and an way drive to the Brisbane Airport. Bathroom vanity, basin, toilet and walk in shower. Hot water is always on and does not need any thing done to make it work. There is a large split system aircon in the lounge dining area, and an aircon in the main bedroom. Both work very well. The reverse cycle aircons can be used for heating if needed in queensland. There is also a small stand alone oil heater if needed in queensland. Yes, this is included in the rate. For long term rentals we can discount your stay if you do not need bed linen and bring your own. There is a standard size front loader washing machine that works very well. There is a standard size electric dryer that works very well. The house has a long driveway enough for 2 cars or car and trailer. Yes this is included in the rate. For long term rentals we can discount your stay if you do not need bed linen and bring your own. There is a standard size dishwasher. Please clean your dishes and empty the dishwasher when you check out. There is a 4 plate ceramic stove. There is a standard size self cleaning oven. There is a 2 slice toaster. There are some pantry items. To help save the environment pantry items may be left from the previous guests that can be used and not discarded. There is a shop within walking distance when needed. there are dishes and utensils enough for 6 people. there are also plastic ones for kids if needed. There is a table and 4 chairs. The dining area is an open plan design connecting to the lounge area and kitchen. There is a good size TV in the lounge. This shows all the free to air channels. There is a good range if books to read while you stay. This is subject to the care taken by previous guests. There are some board games. This is subject to the care taken by previous guests. There are some kids games and toys. This is subject to the care taken by previous guests. Yes there is a broad selection of free DVD's to watch. Please look after them for the next guests. Yes, there is large private back yard with lawn to run around on and easy access to the park. The house has a good size back deck overlooking the large back yard and large park. There are 2 small bicycles that can be used but will need to be maintained by the guest. They are there as an option. There is a back deck overlooking the park. There is a private back deck overlooking the back yard and park. Yes, there are newly upgraded community council tennis courts in the park. See pictures. There are approximately 10 steps to access the house. There is a lovely community council pool close by, there is a fee to enter. It is within easy walking distance. It is the Clem Jones Sports Center and had been recently upgraded. Within 10 km to Brisbane CBD, but backs onto a large private park which also has upgraded tennis courts, basket and netball ball courts, upgraded cricket nets and a fantastic little library. One guest did not realise those activities were all there as the park is so big and only found all the extras by accident. She said it was a lovely bonus. Very much enjoyed our stay. Thank you so much. Such a comfortable house. Everything we needed and a cozy couch. We had a little trouble with the bed in the first bedroom, the slats on the far side fell out on a few occasions when sitting on the edge of the bed but they were replaced with a little effort. We even had a few possums visit. Luckily they were persuaded to stay outside. We stayed at this house for a couple of weeks when we were in between rental houses in Brisbane. We are a family of six and found the house very spacious and easily accommodated all of us. There are even three separate dining areas (one of them being on the covered deck). The house has everything that you need, including a very well equipped kitchen (we even found a waffle maker), books, DVDs, dishwasher, washing machine, everything you need for cleaning etc. Be aware that it doesn't have a bath tub. We found the house to be very clean. The house has got some good breezes, ceiling fans and air conditioning in the living room and the main bedroom, so even in hotter months you can still stay cool there. The location suited us perfectly: No road traffic noise, even though it is in short walking distance to several different bus lines and the local IGA plus some cafés. Off-street parking is available in your own driveway (even with enough space for our trailer). The owner, Clint, responded very quickly to any queries I had. The furniture is practical and very comfortable, and I liked in particular the matresses and sheets which seemed all rather new to me (the house itself is older but for me that is not a problem). I think the value for money relationship is excellent here. There are not many houses around in this lower price range like this one. I would come back here anytime and recommend it to friends and visitors! Everything you need in a home away from home stay. Although an older house, we had everything we needed for our family stay in Brisbane. In a great location just 25 mins from the CBD and on the main bus lines, it made exploring Brisbane a breeze. Great local amenities and with a lovely park, playground and library just over the back fence and the swimming pool and rec centre within walking distance, this is a perfect spot for families. However we did suffer many nights disturbed sleep due to possums being on the roof every night (one night there were 5 of them! ), fighting and making loads of noise. If the very tall bamboo tree in the back garden was cut back, it would stop the possums being able to get up on the roof with such ease. It makes a brilliant ladder for them! Our two weeks in Brisbane was a mix of family vacation, shopping trip and medical checks - a brief visit to civilization and break from remote life in the islands. This house was perfect for us - nothing fancy yet very comfortable with lots of space for our kids who are used to life in the bush. We appreciated the transparent listing, so we were not expecting more than it offered, it actually helped us choose this property over others. Yes, it's old, in need of work, but that didn't matter to us at all. If you're looking for luxury accommodation with designer bathroom etc, this is the wrong address, book the Meriton instead, but if you are looking for affordable, comfortable accommodation in the suburbs of Brisbane that feels like home, this is the place. The exceptionally high level of cleanliness needs to be mentioned separate. Westfield Carindale Shopping Centre is approximately within 2 kilometres.